Facility: toilets, showers, solid tables for equipment at the parking space close to main entrance and Little Brother entrance. Many factors may have contributed to an ecological disaster in cenote Chac- Mool and we would need to have more scientific research to determine the exact cause. However, cutting off the vegetation that surrounded the cenote, plus opening the entrance areas, so more sun light falls in, plus rerouting run away water from rain, plus water closets, plus poultry farm is very likely contributing to the pollution of the salt water part of the cenote. Also destroying the natural beauty by building concrete platforms and steps in the water which also is changing pH levels of the water at least temporarily. 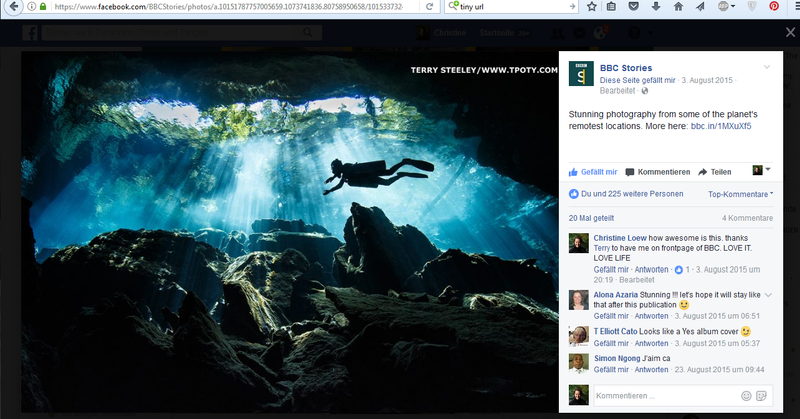 Our rating from ∇ (bad) – ∇∇∇∇∇ (excellent) for cenote Chac-Mool is therefore: ∇ (bad). Cenote Chac-Mool is the closest cenote to Playa del Carmen and still a very busy place. Halocline can be found at a depth of 11m/ 30 ft. In summer you will find the surface water in Chac-Mool cenote up to a depth of 2 m murky and full or micro algae. It is an incredible view from below through the cristall clear water and into then greenish sky. With the many sunken trees and branches it has a touch of surreal and like a fairy tale. In winter view is clear and the water surface undisturbed by diver bubbles works like a magnifying glass and you litterally can see the birds singing in the trees from a depth of 10m. When we cruise the cavern, we will avoid dipping into the saltwater, but the dive is still very unique and features nice formations and an overall great dive experience. Cenote Kukulkan has a wide open area where you can get used to dive in fresh water. The cavern line has been rerouted to avoid the salt water passages and on our last dives there, the visibility was still very bad, so we do not recommend this dive unless you need a fresh-up dive before doing the second dive in the Chac- Mool section or if are a photographer as the light curtain in the open water section especially in winter is still spectacular. Let me also show you the shining cristals and fragile formations of Kukulkan.